You may have heard about a little movie called “Star Wars: The Force Awakens” that is coming out in the near future. The boys, both big and little, are very excited in my house, and I wanted to make them a little something to celebrate the movie opening. My eldest son and I are suckers for a certain droid, so I decided to create our very own little R2D2! Step 1. Cut a smooth foam ball in half and paint it silver. Step 2: Cut out felt pieces for R2-D2’s “head” and hot glue into place. Don’t be intimidated by R2’s head. It’s really just a matter of cutting various shapes and fitting them together like a little puzzle! Feel free to use my pictures as reference. Step 3. Cut a piece of white felt and hot glue around the film canister. You’re going to leave the cap off of the film canister for this entire project. Feel free to toss it, or re-purpose it for something else! Step 3: Glue R2’s head to the open top of the film canister. 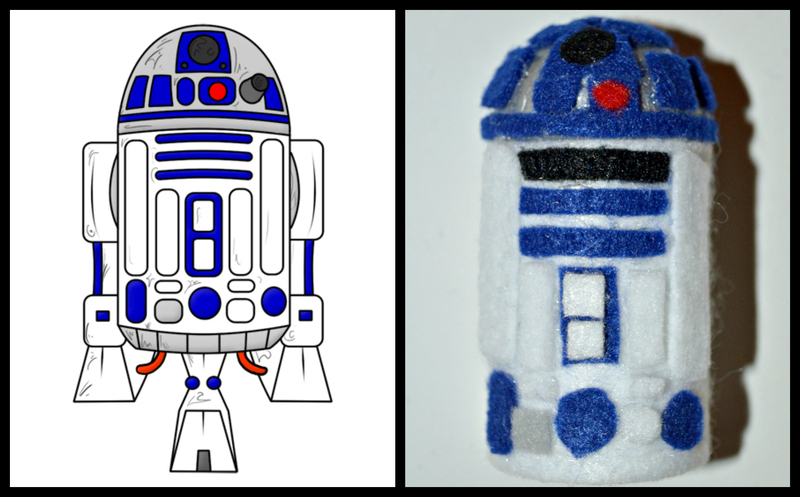 Step 4: Glue felt shapes onto R2’s body. I used the picture on the left as a reference for my R2-D2. You can go as simple or complicated as you want, and remember, it really is just a bunch of rectangles, circles, and squares! Step 5: Cut out legs from the stiff white felt and glue them to the sides of R2-D2. Step 6: Insert small eye hook into the top of R2’s head, and attach a ribbon for hanging. I couldn’t resist, and used my ribbon printer to make a ribbon that says, “May The Force Be With You”. R2-D2 is finished and ready to hang on your tree! I’m so in love with this little guy, and my boys keep trying to steal him so they can “play Star Wars”. When we were putting up our Christmas tree the other night, I asked the boys what was still missing (meaning that the lights weren’t on yet), and my eldest immediately said R2-D2. So our little droid was the first ornament to grace the tree, even before the lights were on. Ha! Have any Star Wars fans in your life that would love a little R2-D2 on the their tree this year? This just might be the droid you are looking for. Yep, nerdy Star Wars reference. Couldn’t resist.